People in PNG are dying of illnesses which are preventable. Many of the illness and health threats to maternal, new born and child health in rural PNG can be prevented or treated easily and cheaply. We already have, in most rural communities, trained lay health workers – known as Village Health Volunteers (VHV) and Village Birth Attendants (VBA). These trained health workers are already functioning. They are involved in providing information to individuals and communities (for example – on adequate nutrition, malaria prevention, TB, birth spacing and hygiene) or treating people (for example – diarrhoea and malaria, safe birth delivery, responses to post-partum bleeding etc.) Many women in our villages across the whole country depend on VBA’s for support and help before, during and after the birth of their child. Without this free service many women, would experience complications, serious illness and in some cases death. 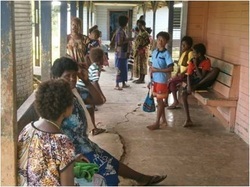 In a report produced by World Vision PNG in 2011 there it was found that there is evidence which “suggests that up to one third of maternal deaths, over two-thirds of newborn deaths and half of child deaths can be prevented through informed community members, trained VHVs and supported by stronger local health centres and community health posts”. Further, a recent review on impact evaluation done in Karachi, in Pakistan (Lassi Z, Haider B. Bhutta Z) suggests that a 32 percent reduction in maternal mortality could be achieved by care packages which can be delivered by these trained VHV. The problem here is, how can we expect these volunteers to do their work without much support? These volunteers give their service for free. They are the unrecognised heroines and heroes in our villages. They often do this at their own expense as well. It is time the Department of Health (DoH) took action to recognise and support these volunteers. After all this is a function which normally would be performed by salaried employees who come under the DoH, be they health extension officers, community health workers or whatever. While the National Health Plan (2011-2020) aims to strengthen rural health services, the retraining of staff and rebuilding rural health infrastructure is likely to take some time. Meanwhile people will continue to have babies and be ill. The only source of help would be these VHV. T t.nd mortality and improvings strengthening and to some degree fill gaps in health service access.nd mortality and improvinghus NDoH needs to invest and support these t.nd mortality and improvings strengthening and to some degree fill gaps in health service access.nd mortality and improving volunteers who can help in rural health systems strengthening and to some degree fill gaps in health service provision. Volunteers receive basic training in health care but other than that they receive nothing. They often have to pay, from their own pockets, for transport to see patients, have to feed themselves while on their way to patients, provide their own clothing and other essentials such as gloves, soap, disinfectant etc. While providing this noble service the volunteers are not engaged income generating activities. Thus this becomes a double whammy and no wonder some give up on being a health volunteer. This is a great loss to the nation. We need to retain these volunteers. Something must be done, and fast. I would suggest that either, support to VHV’s be integrated into the LLG plans and budgets, and thus be seen as a part of local health system strengthening, which would include provision of regular and on-going supervision, support and replenishment of supplies from the health centres. Alternatively I would suggest we could, in the short term, introduce a system of volunteer allowances, but in the long term, we could establish a scheme to offer start-up resources for livelihoods enterprise activities which volunteers could use to generate income. These two actions do not have to cost much. The DoH can easily afford this by diverting some of the funds from other sources. Of course one would expect that structures are put in place to administer the scheme to avoid abuse of the scheme. It would be easy to involve community based organisations and non-government organisations to administer this e.g. 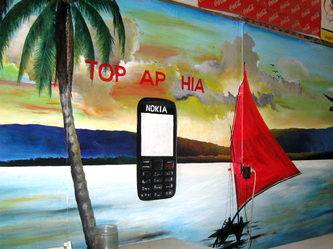 CWA, Tingim Laip, World Vision, Save the Children, VSO. These organisations are already involved in the training of health volunteers. The basic structure is in place. Obviously there may be other interventions to support health volunteers and other ideas would be welcome. Meanwhile lets us put something to support these volunteers, now and we can have a debate about other options later. Are you currently in school? No, I am in home schooling. It is a home based school program , a service provided by the Creative Self Help Inclusive Education Centre for children and young adults with disabilities. What is the biggest challenge to you when you attend school? Sometimes my home based school teachers do not attend to me to further my education due to the centre lacking staff. Why is education important to you? Education is important to me because it means knowledge, money and a life to me. What are the barriers or challenges to attending school? I have an ulcer on my foot which refused to heal for quite a long time that stops me from attending main stream school besides my physical disability. What are the dreams for your future? 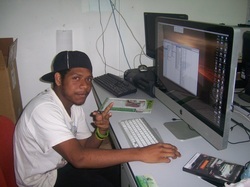 I want to be an IT person, working with computers; repairing and designing programs. What do you want people to see you as, when they see you? I want them to see me as a human with good knowledge and skills. Pamela is aged 76 years old and lives in a small village near Gusap in the Ramu Valley with her daughter, son and 3 grand children. She has a small vegetable garden of her own, in the back yard of her house where she grows vegetables for her daily needs and cooks them for her family. As days passed, she slowly started losing her eye sight in both eyes and she did not know why. She took this as a process of aging and also Gods will. Three years back she went totally blind but never gave up her cooking interest. She would visit her garden daily, feel the small mounds of sweet potato and when she felt they where big and ready, she would dig it out with her small digging stick, then take it to her house, where she would wash and peel them. After peeling she would feel the sweet potato or banana to check if she had completely peeled the skin off, then she would tell her grandchildren to make the fire so that she can cook. She would know when her cooking was ready from the aroma drifting from the pot, and she would tell her children to come and serve dinner. This went on and she went on with her routine but of course not as sure as she was when she could see with her eyes. On the day that the Fred Hollows outreach team set out for Gusap, Pamela was gathering her family to ask them to all agree and they prayed to God to take her to heaven because she had enough of her blindness. 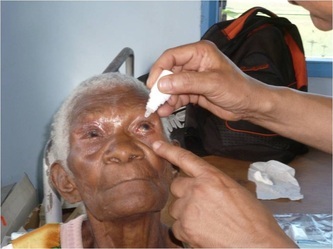 Her granddaughter was beside the road when the eye surgery team on their visit to Gusap, dropped the toksave about the surgical outreach in her hand. When she went to the family gathering with the toksave, it was a message sent from God for Pamela. Pamela was brought to the health centre holding a long stick walking behind her Grand daughter and her son. 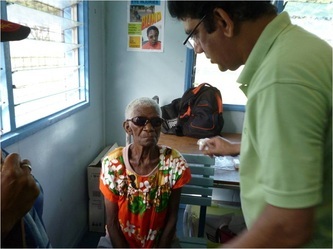 Doctor Sameer Dabral examined her eyes and found her to be blind due to mature cataracts in both eyes. On the very first day, her right eye was operated on. The next day her life changed, she was so happy and very eager to have her other eye operated on. 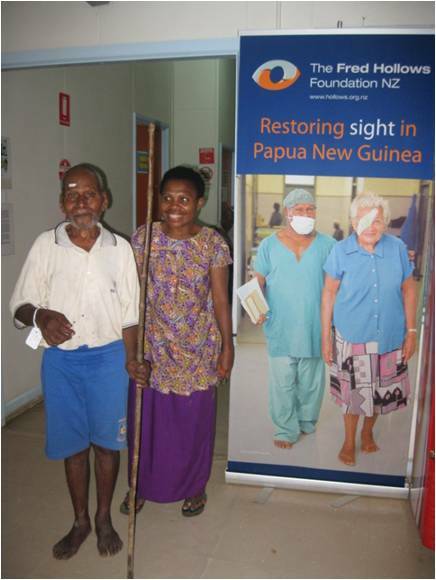 She has now regained her lost eye sight after 3 years of total darkness, Pamela was excited and very thankful to the eye team at Fred Hollows for bring her sight back..
Today Pamela is having 6/12 vison in both her eyes and she is back to her routine work with full strength and energy. 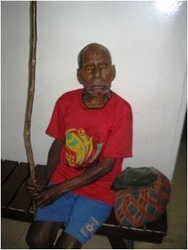 Lucas Avia is a 75 year old man from Paribana village in Bundi. He was home bound for 4 years due to the cataract he had in his eyes. His children and the villagers thought that it was incurable and that he had reached old age and had gone blind. But a ray of light entered Lucas Avia’s life when Augustine Koroma from Naka Optical carried out some outreach work in Bundi. Augustine saw that Joe was not blind but had bilateral cataract and his heart went out to Mr Avia and knew that a simple operation could restore his sight. So he decided to bring Lucas to the Fred Hollows eye clinic in Madang for treatment. First with the help of some of Lucas’s children they built a stretcher to carry Joe on the 9hr bush walk from Bundi to Brahman. From Brahman, Lucas was put on a canoe and paddled across the Ramu river to the main road. From the main road Lucas and Augustine where able to catch a PMV bus and come to the Madang Fred Hollows Eye Clinic. 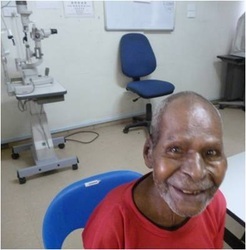 Lucas came to the Fred Hollows Eye clinic on the 14th of June 2012 and Dr. Sameer examined his eyes and booked him for cataract surgery on the following day. His right eye was operated on the very next day, after two nights in the ward, Dr Sameer operated on Lucas' left eye. After 3 days, his visual acquity was 6/12 & 6/9, a truly remarkable transformation. The full recovery took 6 weeks. Lucas was overjoyed to have his vision back and will definitely inspire others with cataract from his village to come to the Eye Clinic for the life changing operation. Story compiled by Fred Hollows PNG nurses. 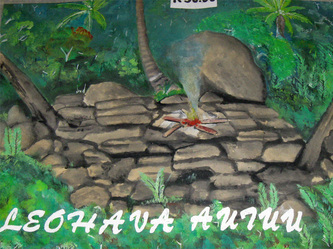 Alotau: His paintings are “not too good, not too bad, but just Good Enough!” as Gerald Fofolu expresses it with a smile. 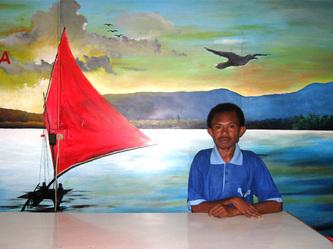 Contracting polio at an early age, this young man now is making ends meet with his paintings as a gifted artist. The 21 year old comes from a mixed parentage of the Trobriand and Good Enough Islands in the peaceful Milne Bay Province. Proving to others that he was capable to attend school despite his disability, Gerald completed his grade 10 at Santa Maria High School. 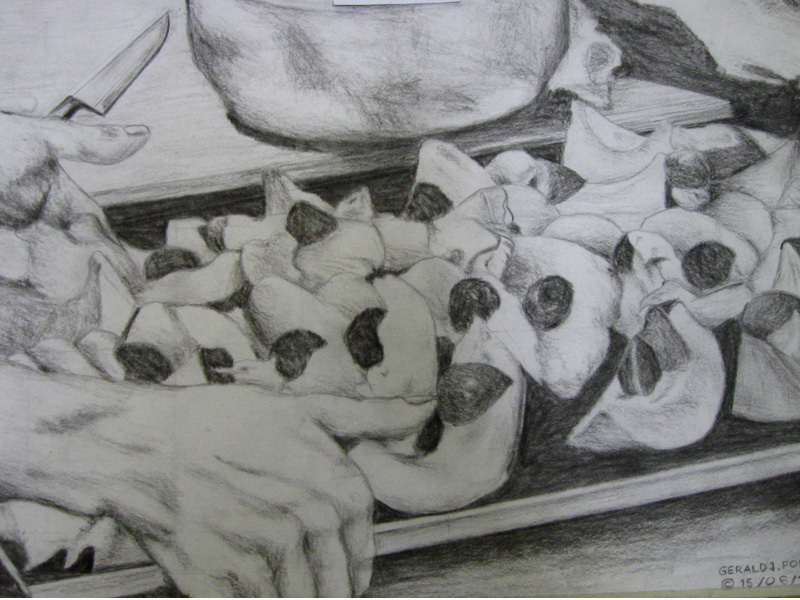 As his heart was in the arts, this young man continued painting after completing his grade 10 in 2006. Gerald is well known for his talent and good nature on the island of Good Enough and has contributed immensely in going back to help volunteer and teach students from Watuluma High School. Getting inspiration from other artists in the province such as Dickson Lige and Enoch Kiluma, Gerald is certain to make his mark. 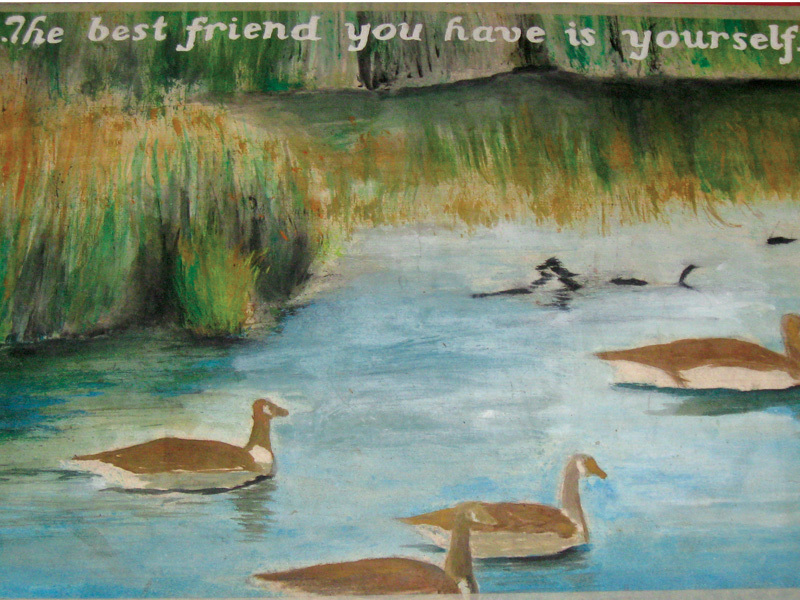 This person with disability looks deeper down in himself to paint about his diverse and rich heritage of his environment to put his expressions in color on boards. Since the establishment of a Disabled Persons Organization in Alotau in March last year, Gerald has moved to the province’s center to sell his paintings. He has made remarkable progress with his paintings being sold to Alotau International Hotel, Bay Cabs, Alotau Christain Bookshop including delivering his services to Cameron Secondary School, Alotau General Hospital and countless individuals. Some of the best artists deal with disabilities in their everyday lives that the rest of us cannot even imagine living with, and use art to communicate with the world. The results are often stunning. Some of these artists have been marveled for ages such as Vincent Van Gogh, a Dutch Painter and is regarded as one of the greatest painters the world has ever seen. Van Gogh suffered from mental illness. Against all odds, these persons with disabilities look beyond the horizons of their disabilities to see the beauty of their ability that make history. 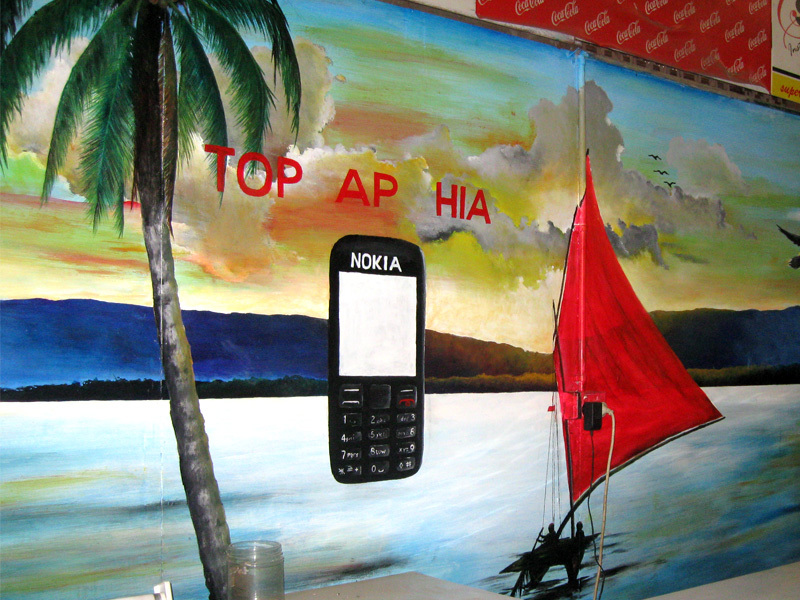 More and more Papua New Guineans are breaking barriers in our traditional societies in making inspiring stories. 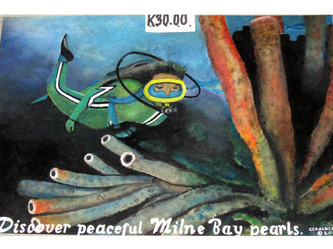 Gerald Fofolu, is no exception as a young artist from Milne Bay Province. With a determination and strong left hand, Gerald smiles and looks forward to contributing to the development of his province in projects that anyone can include him. Gerald Fofolu is currently freelancing in Alotau, Milne Bay Province and would love to work with anyone who needs his assistance in the arts. Gerald can be contacted in the address provided. Let us give persons with disabilities such as Gerald an opportunity to contribute to development with their talents. A big part of NDRAC’s work is to profile and promote good practice and new ways of working that can move Papua New Guinea towards a fully inclusive society. In November, NDRAC had the privilege of meeting up with Shirley Moiga, Secretary of the Eastern Highlands Province Disability Secretariat to discuss how disability has been pushed up the political agenda in the Province through the development of the Eastern Highlands Disability Committee (EDC) in 2009, a Provincial Disabled Person’s Organisation (DPO). Shirley has a physical disability caused by polio. NDRAC: How did people with disabilities (PWDs) come together to form the Eastern Highlands Disability Committee (EDC) and the Disability Secretariat in the EH Provincial Government? Shirley Moiga (SM): EDC was initiated by PWDs, who came together and other partner organisations to establish an organisation that would be about PWDs supporting themselves. The founding members wanted to do away with the charity model and start to move towards a rights–based model which emphasis that PWDs have the same rights as all human beings. The idea was initiated by Martin Kawage (vision impairment), Israel Kine (vision impairment), Billy Saitore (physically challenged - crutches) and Jim Ranisoso (physically challenged – crutches) who held their first ever meeting under a tree and came up with the idea of setting up an organisation with PWDs as members and leaders in voicing the concerns of people with disabilities to ensure equal and full participation in all aspects of life. The group began to grow with support from VSO volunteer Marcel Pool and through networking with other organisations including; Mt. Sion, Physiotherapy, Save the Children Fund, Mercy Works and National Sports Institute. EDC was officially formed in February 2009. EDC’s activities ranged from empowerment workshops to major regional awareness raising campaigns to promote disability rights. It was during one of these events that Ishmael Leanave (physical challenged) approached the then Governor, Malcolm Smith Kela to see if he would create a disability desk within the Provincial Government, he agreed but on the condition that the position was taken by a PWD. In November 2011, Mr Smith fulfilled his promise and I was successful in my application to become the first ever secretary to the EHP Disability Secretariat. Later that month during the EDC Assembly meeting, the National DPO (Nokondi Association of Disabled Persons – NADP) was established. NADP is an umbrella organisation representing District DPOs in the Eastern Highlands. NDRAC: What did you learn from this experience? SM: I think all of us involved have learnt a huge amount. We know that to achieve all these things takes time, effort, patience and persistence. If you want something to be done right you have to take the initiative and do something yourself before seeking assistance from others. We learnt that we are differently able and issues concerning us need our input because there is “Nothing about us without us”. SM: Essentially, all of our successes have been as a result of working together and putting our personal challenges to one side. I’m particularly proud of the support we give DPOs in the province to help them to become established. We support grassroots and district DPOs to develop through awareness raising delivered by PWD leaders in the districts. The DPOs in these communities then request EDC and NADP members to conduct empowerment and capacity building training to help the DPOs to become sustainable. This training is funded by EHP Disability Secretariat. The established DPOs then advocate for their own rights by bringing the issues to NADP meetings, which are then taken forward to EDC and all partners discuss the issues and look for solutions to address the problems. The secretariat then brings these issues to the Office of Community Development and the Provincial Government to advocate for disability inclusive development and secure funding to implement inclusive policies. - Delivered awareness raising events across the Province, including, climbing Mt. Wilhelm, which is being made into a documentary titled “Trust Without Boarders” by Yumi Piksa. - Developed a strong and wide reaching network of organisations to ensure disability is kept at the top of the development agenda. - Increased the number of empowered PWDs’s who are able to advocate for their rights. NDRAC: Disabled Person Organisations (DPOs) are key to ensuring that Provincial Government’s across Papua New Guinea develop inclusive policies for their citizens. In your experience of supporting the development of DPOs what is needed for their success as organisations? - PWD’s must be persistent in their plight to be treated as equal participants of the society. 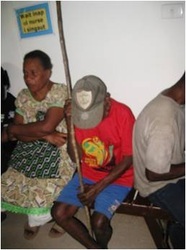 As with many provinces in Papua New Guinea, there is a very high level of illiteracy rate amongst people with disabilities, which makes it difficult for information dissemination and training. We also need more funding to support grassroots DPOs with their awareness raising, advocacy, and funds to provide more training. Mobility for PWDs is very important because we are at the forefront of the disability movement in the province and need to be able to travel around to the remote areas of the Province to meet with and support grassroots organisations. To make a real impact and ensure that local and national Government are putting in place inclusive policies with the funding to implement them, we need better coordination of all organisations and services providers responsible for creating an inclusive and barrier free society for PWDs. NDRAC: Thank you Shirley for giving us so much of your time. It is great to hear about the achievements the disability movement has made in Eastern Highlands. I hope NDRAC can support EDC to continue their good work and inspire other Provinces to follow your lead. SM: Thanks NDRAC, keep up your work too. The Eastern Highlands Disability sector is looking forward to working with you in 2013. This is a personal experience written by Nelson Walo, a hearing impaired Camera-man trainee on his first trip via Port Moresby to Kiunga in the Western Province to shoot his first Documentary Film. These are the exact words how he expresses himself. "I felt very nervouse and scared of the aeroplane because it would be my first flight and a lifetime experience. I never flew to other provinces by plane before, only by road. I learnt the safety instructions demonstrated by one of the flight attendants when I was onboard. I also learnt that at all times fastening of the seatbelts was one of the most important safety rules to adhere to before take off and before landing. To my surprise, at the security checkpoints, we were asked to remove all our things for scanning of illegal smuggling of drugs and other things. The International airport was huge and has many gateways I suppose. Port Moresby was very huge to me compared to Madang with many streets, tall sky scrappers, including magnificent arts decorations on the roundabouts. I was amazed to see traffic lights with its busy cars. People appeared to be very busy with their work. I hardly saw much of 10-seater and 5-door land-cruisers on the four lane road. I was enjoying my tour in the city and I learnt many new things in the hotel and restaurant where we stayed. Living in the hotel and using a knife and fork on the dinning was very difficult for someone like me, but I was inspired of these. Traveling to Western province on the DC aircraft, I saw many beautiful land scapes and was enpleased that our good Lord has moulded my country beautifully. It was my first time to see PNG's largest river, the Fly River. After arrival at Kiunga, I noticed something very unique. It was the greeting style which was different from that of mine in my own province. The school that we went to see, I found some of my disability friends there to my surprise. I noticed that most of the students at the school were girls and very few boys. Seeing also people traveling on canoes without out triggers made me very nervous, however, I enjoyed and learnt many things out at Kiunga. The shooting of the short videos and documentary with the video camera was a new thing to me and I was confused with some uses of it but I was grateful with he assistance and teaching by my instructor, Mr. Robert Banasi. I learnt from my instructor of very useful filming techniques which I enjoyed during the shooting in Kiunga. I always checked the camera's battery and applied all filming techniques on every shooting. Handling the video camera sometimes takes away my energy in working. However, it was interesting and it taught me many new things. The very most difficult part I experienced in shooting was when I was directed to film the canoes paddling across the Fly River. Finally, I surely found confidence in using the video camera for shooting short documentaries or videos with little supervision. I would like to learn to the best of my ability to do very good shootings professionally in the future. However, the best thing that I experienced in this shooting learning process was the handling of the video camera." 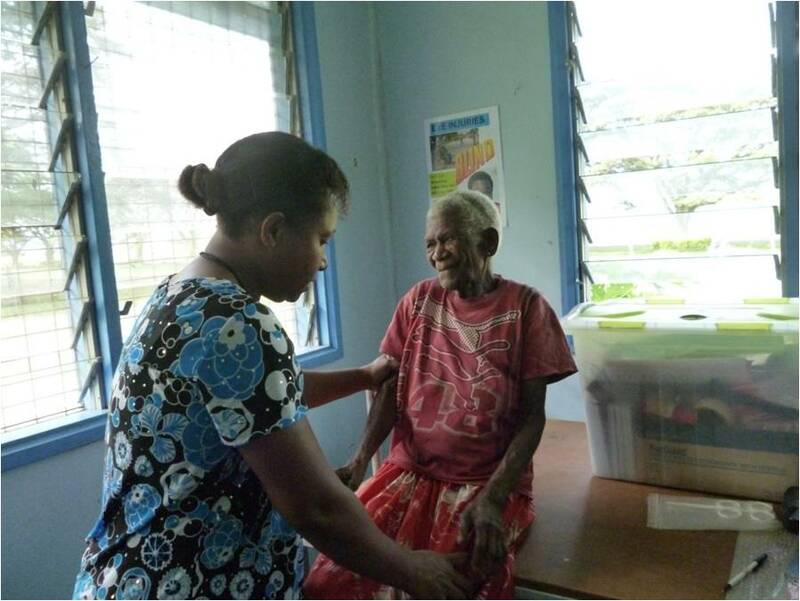 NDRAC's VSO volunteer Ed Howarth gives his account of the progress and challenges facing the disability sector in Manus Province on a recent personal visit to see his wife who has been working in Manus with the Provincial AIDS Council. On arriving in Lorengau, it didn’t take long before I was pointed in the direction of Lorengau General Hospital to meet a lady called Emily Sombe, Manus Province’s first Papua New Guinean physiotherapist. 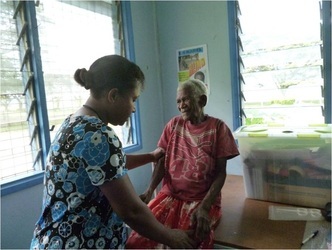 Physiotherapy is a relatively new service in Manus, it has only been available since 2008. At that time it was provided by a VSO volunteer who then passed over the responsibility to Emily in 2009. Emily now works alone and spends half her time treating patients in the hospital wards and half her time with outpatients. Emily was positive about the progress that she had made and the increase in the number of clients she has but she highlighted a number of big challenges. The first being the lack of resources she needs to provide the services she knows her clients need and secondly, the lack of transport in order to deliver outreach work to the many hundreds of people with disabilities who are unable to reach Lorengau General Hospital for treatment. My next stop was Callan Services based in the centre of town, here I met with Liwer Mohe, the centre Coordinator and two CBR officers, Ignastius Sapatale and Elizah Johanes. The centre provides adult literacy and vocational training to people with disabilities. They also deliver ear and eye assessments out in the communities to help with early intervention, alongside promoting inclusive education and health services for people living with disabilities. Again the challenges facing Ms Mohe was the lack of resources to expand their programmes. During this meeting I began to hear about the Manus United Disability Association (MUDA), an organization that has been established by PWDs for PWDs. Another short walk and I was at the home of Nickson Solomon, the Chair of MUDA. MUDA was started in 2008 by Nickson Solomon and several other PWDs to help raise the profile of people living with disabilities in order to advocate for their rights to the Manus Government to ensure services improve for PWDs. MUDA also works hard to try and change attitudes about disability to help break down some of the barriers to a truly inclusive society. Attitudes are changing in Manus, and as a result, this year over 40 PWDs took part in the Provincial games for the first time in Manus’ history, which is a great step forward. Currently MUDA has around 20 members including; Disability and Women run by Christine Ndrepolou and Manus Disability Sports Association, who are currently fundraising for the PNG Games in Kokopo. It was clear from talking with a number of the members of MUDA that they were in real need of training and resources to help build MUDA and the other DPO’s in Manus into organizations that can have a real impact. Importantly, Nickson felt that MUDA needed training alongside financial resources. We both discussed how money can often lead to the collapse of an organization, if the skills needed to manage the money and the projects are not there beforehand. I hope that PNGADP and other agencies will look at developing a training programme for DPOs across Papua New Guinea to help build their capacity in these areas. My week in Manus was inspiring and I was impressed with the dedication of people who are supporting the development of a more inclusive society. There are without a doubt many challenges facing people with disabilities in Manus. But I felt that if they were given the recognition that they deserve, then the disability sector in Manus has the potential to become strong through building on the institutional services provided by Emily Sombe in the physiotherapy department and the services provided by civil society through Callan Services and most importantly supporting the growth and development of a strong voice through the various Disabled People’s Organisation in Manus." In 1992, I suffered from meningitis which caused severe damage to my optic nerves. My doctor told me that I was permanently blind. I could never see again and enjoy life for the rest of my life. Out of desperation, I asked if there was still a way possible. His response was when a nerve was dead within the central nervous system that was its permanent death. the only possibility of the restoration for such was outside the central nervous system. That can be pursued later in life through other rehabilitation practices. I went home saddened, feeling empty, hopeless and meaningless without sight. I was thinking of ending my life. On the following year, Ms Lucy Japu a young Community Base Rehabilitation (CBR) worker from the Creative Self Help centre for the Disables visited me after receiving a referral note from my former employer the Lutheran mission education secretary, Mr. Selmai Kazu. Since then she visited me weekly on every Wednesdays for ten years with her CBR skills just to convince me that there was life beyond blindness regardless of my disability. In 2001, on one of her many routine visits she shared with me one of her CBR experiences About how she assisted a little boy with cystic fibrosis to get on to a new wheelchair while the boy’s parents said and thought he couldn’t make it. However, regardless of the negative comments the boy did get onto the wheelchair. I realized that she was in tears when sharing that experience. That gave me something to think about. Here I got out of my stubborn will and got fully involved in many of the CBR programs for the last nine years. I got empowered by attending various capacity building seminars, trainings, workshops and meeting other people with disabilities and sharing life experiences both in and out of the country which gave me a different approach to life beyond blindness/disabilities. Although I still have many challenges as I move on in life each day I can at least SMILE and say thank you to God , my families friends , the many people and organizations to name a few like; CBM who supports and fund the CBR programs for the Creative Self Help centre, VSO and others who came into my life and moved on in one way or the other had contributed to see the turnaround in my life. I am now employed as a teacher for the Blind and vision impaired children at the CSH-Special education resource centre. My motto in life is Accept what you cannot change and Change what you can change and live one day at a time. DO NOT LOOK AT MY DISABILITY BUT LOOK AT MY ABILITY. Your ignorance is my disability. My name is Ziggy Satkurin and in my thirties, I have a disability with paralyses on both of my lower limbs from a polio strike in the mid-1980s. I come from a village called Miamrae, about 45 km north of Kiunga, North Fly District, Western Province. I started attending this program since this project was established. I was very interested in learning new skills like; computing, screen printing, sewing, working in the library etc…and other activities done in the project. What I have learnt from the project has given me the courage to do something for myself at home to sustain myself financially. I sew meri blouses, shirts, etc…and sell to earn money and also repair sewing machines and I am paid. I also was very interested in disabled sports, and being in this group has helped me pursue my dreams in sports. We PWDs from this group attended the PNG games in 2009 and as it was our first time. I didn’t have the best sports facility for power-lifting but with strong determination and confidence I tried my best with whatever was available to take part in the PNG games. 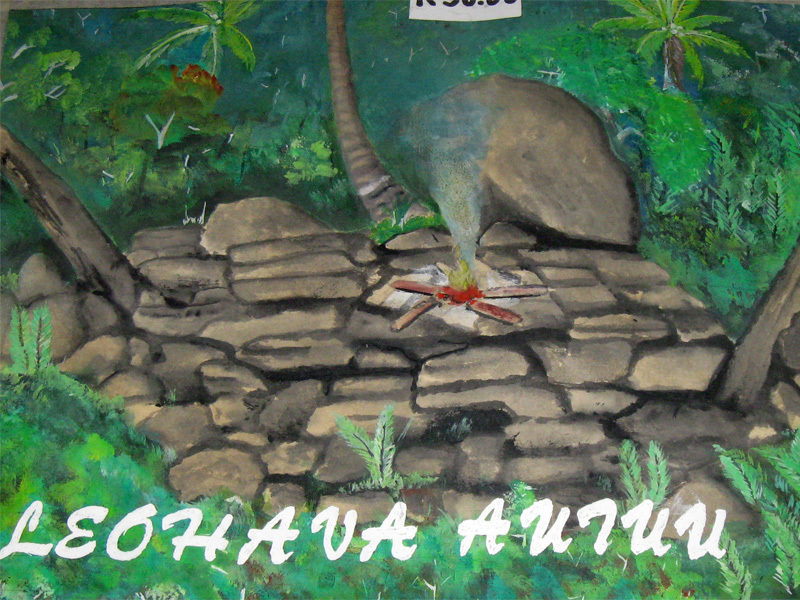 This blog is written by different authors from around Papua New Guinea. Each post is a personal account of the different aspects of living with a disability or working in the disability sector in PNG.